The one thing that is 100 percent certain is the fact that one day, we all will die. While this isn’t something we tend to dwell on, it is a reality. When that day comes, will you be ready, will you triumph over death? 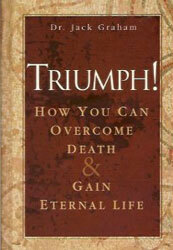 In this book, Pastor Jack Graham shows you how you can triumph over death and enjoy an eternal life in the presence of God forever!